Reporting today on the state's teacher shortage, the Tulsa World quotes Ryan Owens, general counsel for the Oklahoma State School Boards Association, as saying administrative costs are only 3.54 percent of district expenditures statewide. Where does Mr. Owens get this figure? Well, as the school monopoly folks like to remind us, "Section 18-124 of Title 70 of the Oklahoma Statutes defines administrative costs in public schools and establishes caps on the amount of the funds districts can use to pay for central office administrators and staff. These costs are typically referred to as 'administrative costs' in rhetoric regarding education funding." The data-gathering arm of the U.S. Department of Education sets its own definitions for categories of spending. This is useful for making valid comparisons across states, but it also reduces the danger of shenanigans in the definitions. Where government agencies are collecting data on government systems you can never fully escape self-serving incentives, but in my experience the federal education data professionals have a reasonably good track record of playing it straight. So it’s useful to turn to their data and see what they say Oklahoma spends. According to the most recently available federal budget data, 8 percent of Oklahoma public education spending went to administration in 2010-11. That includes 5 percent ($266,368,000) for administration in local schools and 3 percent ($165,215,000) for administration at the district and state levels. That’s roughly in line with the nationwide figure, which is 7 percent for administration at local, district, and state levels. However, there are even more eye-catching numbers elsewhere in the public school budget. 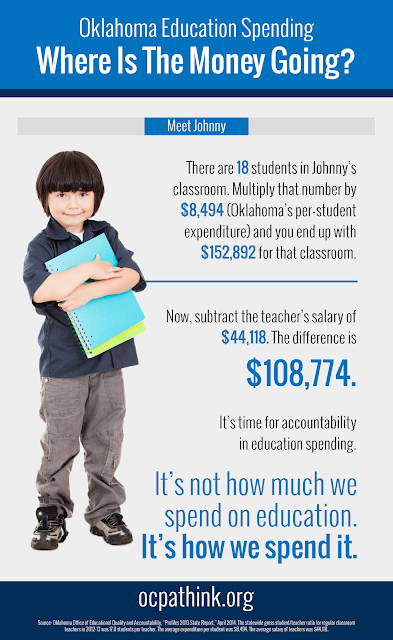 Most Oklahomans would probably be shocked to learn that only 51 percent of public education spending in their state goes to what is supposed to be the core function of schools: instruction. The rest goes not only to administration but to a variety of "support services" and "other expenditures" like guidance counselors, nurses, buses, and cafeterias. Why carry all these inessential services on the public payroll? ... It’s so their unions can keep the dues money rolling in. The unions, in turn, ensure political protection for their monopoly by mobilizing their members as voters in elections for legislatures and school boards. Politicians in both parties and the government school unions look out for each other, and everyone wins — except for the rest of us.